Christian Scott aTunde Adjuah is an energetic and passionate Jazz musician, composer, producer, and bandleader. He is popular for bending genres to create a type of jazz that is enjoyed by millions around the world. He is known for a lot of things in the world of jazz music among which is his unique style of handling the trumpet, which he nicknamed Whisper Technique. His first albums scored him a Grammy Award nomination and he is also a two-time winner of the Edison Awards. Christian Scott aTunde Adjuah who is also called Christian Scott was born on March 31, 1983, to Cara Harrison and Clinton Scott III. He added aTunde Adjuah to his name as an acknowledgment of his family’s African lineage. Christian has a twin brother, Kiel who is a filmmaker and he is a nephew to legendary innovator and saxophonist, Donald Harrison. Scott is an American and was born and grew up in New Orleans. He grew up being immersed in the Black Indian culture and the music of the city where he grew up. He is currently a strong force to reckon with in jazz music and began his journey into this world at the early age of 11 when he was given a trumpet as a gift from his mother and grandmother. He started attending the New Orleans Center for the Creative Arts while being tutored by his uncle, Donald Harrison in jazz music. Christian Scott aTunde Adjuah started going on musical road trips from the early age of 13 along with his uncle. He graduated from high school in 2001 with an impressive result largely because of his grandfather’s influence. He was then awarded a full scholarship to study at the Berklee School of Music in Boston, Massachusetts under the direction of instructors Charlie Lewis, Dave Santoro, and Gary Burton. He graduated in 2004 and earned a degree in professional music alongside film scoring. 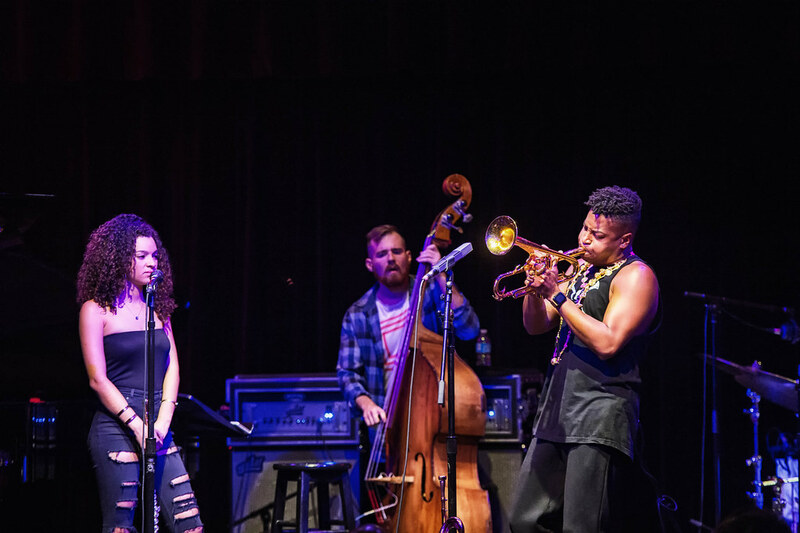 Christian Scott revealed in an interview that he was glad and privileged to have been part of the University as it exposed him to an alternative way of thinking. While at college, he was chosen to form a quartet – four of the school’s finest musicians to partake in the Berklee Monterey Quartet and played at the Monterey Jazz festival. Christian Scott aTunde Adjuah began his career by appearing on records with his uncle, Donald Harrison. Unlike his uncle, Scott picked the trumpet as his musical instrument. When asked of the reason for his interest in trumpets, he said it was a lot like boxing, so since he was a boxer, it drew him to the instrument. He described playing the trumpet as physically demanding, just like boxing. Years later in 2006, he recorded and released his first and major solo at the age of 22 called Rewind That. The album was a great success and one of his biggest hits as it was nominated for the prestigious Grammy Awards. At this time, he was a musician under the record label Concord Jazz. Rewind That was a fusion and a blend of different styles of music such as rock, R&B, and modern jazz. His second album came a year later and particularly after Hurricane Katrina had affected his hometown of New Orleans. The album was titled Anthem and was a heartfelt response to the suffering that ensued as a result of the hurricane. Scott’s music was and still is a social commentary, a decry of the political and social ills happening in the society. Christian Scott aTunde Adjuah released his third album in 2010 titled Yesterday You Said Tomorrow. This was a statement often used by his grandfather as a way of emphasizing the importance of recognizing the task at hand and utilizing the available time complete a given task. In 2012, he released another album, this time a double-disc titled Christian aTunde Adjuah. Scott’s music was a cut away from conventional jazz music; he created his type of jazz and called it ‘Stretch Music’. Stretch music is an experimental genre blind kind of jazz that attempts to stretch jazz rhythmic, melodic and harmonic conventions, that encompasses the culture and language of various people, marrying the sounds to an extent that they become inseparable, leaving the listener wondering what the musician is trying to say about the people. With the birth of Stretch music, came the birth of his record label in 2015, bearing the same name, it was a merger of Stretch Music record and Ropeadope records. Christian also produced an app, Stretch MusicApp that had special features that were very suitable for musician users. This innovation won him the prestigious JazzFM Innovator of the Year Award in 2016. The years that followed saw more albums from the stables of Christian Scott aTunde Adjuah. Most recently in 2017, he released an impressive trilogy album called The Centennial Trilogy; it was a sobering re-evaluation of the socio-political realities that plagued the world at that time. The album contained tracks like Diaspora, Ruler Rebel, and The Emancipation Procrastination. Summarily, Christian Scott has 12 studio albums and two live recordings to his credit since the inception of his music career. The famous musician and jazz demigod, Christian Scott aTunde Adjuah has had an amazing career since 2002. Since he came on the scene with the revolutionary style of jazz music, Christian Scott aTunde Adjuah has recorded nothing but successes all the way. It, therefore, comes as no surprise that the revolutionary singer is worth much – up to the tune of $1.7 million. Christian Scott is married to his girlfriend of three years, Isadora Mendez. Christian proposed to Isadora at the New Orleans Jazz Fest in May 2011. The couple was said to have met three years ago at a boutique in Soho, where she worked. He was love struck as soon as he set his eyes on her and struck a conversation. She was unfamiliar with his music, so they could not relate on this terms, however, he raced home to retrieve his press kits and asked her to be a model in his upcoming album photo shoot. She didn’t make the cover of his album but she made away with something else; his heart. The duo got married on May 13, 2013, however, there are no records of the couple having any children. Isadora Mendez is a song writer, dancer, cake dresser and a visual artist. She was born in a Germany to a Puerto Rican father and a Dominican mother.